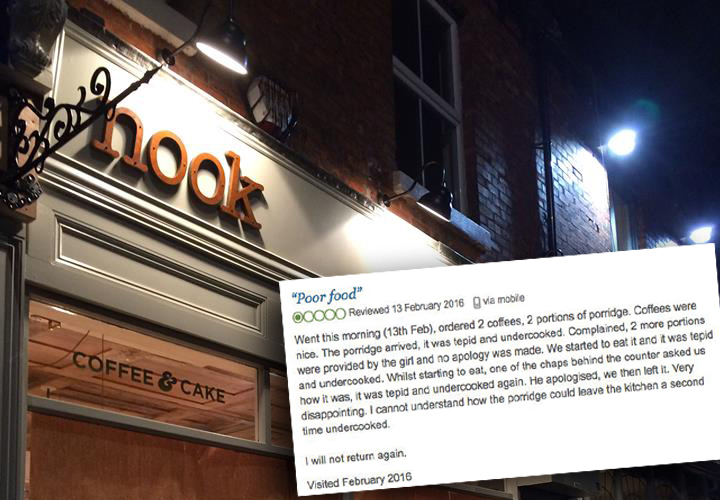 No one likes unnecessary moaning, and the guys at Nook Neighbourhood Coffee in Manchester, UK are no exception. After their in-house porridge was criticised and called ‘tepid and undercooked’, not just once but three times, the cafe owner decided enough was enough. Nook responded to the less than complimentary 1-star review on TripAdvisor. But rather than retort with a delicate apology or bury the comment with a few homegrown glowing reviews of their own, they had a better idea. The photo of the creative chalkboard was posted by comedian Justin Moorhouse and has since gained wide social media acclaim as being very damn funny. The idea was just to try and do something a bit different. The lady’s comment was quite disappointing because we try to provide the best service at all times. Seeing the comment pop up on TripAdvisor was a bit of a shame. It’s not the first time social media has clapped Nook on the back for its refusal to abide by the A-board selling script. Nook and its innovative coffee connoisseur captain are living proof that fighting fire with shade and a sense of humour wins the war in the end. Ignore the reviews, do it for the love of food.